Coffee is the seed of a "cherry" from a tree, which grows from sea level to approximately 6,000 feet, in a narrow subtropical belt around the world. 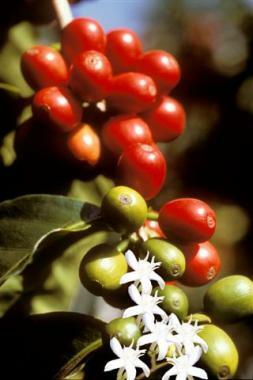 The coffee plant first produces delicate clusters of white blossoms, resembling jasmine in shape and scent. These blossoms last only a few days. Small green coffee cherries then begin to appear and ripen to yellow. red. and finally almost black, within six to nine months. Coffee cherries ripen at different times, and in order to achieve consistency they should be picked only when fully ripe. On a quality farm where the coffee is hand-picked, the farmer will return to each tree up to 8 different times to harvest only the ripe cherries. Once the coffee cherries are picked, they are transported for processing. The fruit is then removed from the seed by one of two methods. The natural or dry process, where the cherries are dried in the sun or in dryers, and the fruit is then separated from the bean by processing them through a mechanical husker. Or, by a superior soaking method known as the wet process, which produces beans which are referred to as washed coffees. The green beans are then dried, sized, sorted, graded and selected, usually all by hand. The beans are then bagged and are ready for shipment to local roasters around the world. Few products we all use require so much in terms of human effort. The two commercially significant species of coffee beans are: coffea arabica (the only type of coffee we buy), and coffea robusta. Arabica beans grow best at altitudes over 3,000 feet. This species produces superior quality coffees, which possess the greatest flavor and aromatic characteristics. They typically contain half the caffeine of the robusta beans. Arabica production represents 80% of the world's coffee trade, however, only 10% of this meets Eastern Coffee’s quality standards. Robusta beans are usually grown at lower elevations. Robusta trees are easier to grow, produce higher yields, and are more disease resistant than the arabica species. When it comes to flavor Robusta beans usually possess a woody, astringent taste. They are used when a lower price or additional caffeine is desired. A small percentage is typically added to many Italian espresso blends for the additional crema and complexity they contribute.